BRUSSELS (AP) — Belgian authorities searched Wednesday for a man pictured at the Brussels airport with two apparent suicide bombers, amid growing suggestions that the bombings of the Brussels airport and subway were the work of the same Islamic State cell that attacked Paris last year. Several people who may be linked to the Brussels attacks were still on the loose, and the country’s threat alert remained at its highest level, meaning there was danger of an imminent attack, said Paul Van Tigchelt, head of Belgium’s terrorism threat body. The attacks killed 34 people, including three suicide bombers, and injured 270 others, authorities said. 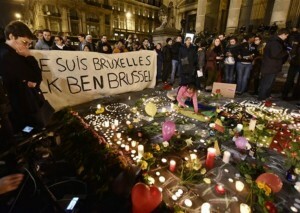 Belgium began three days of mourning, and government offices, schools and residents held a moment of silence to honor the dead, marking the moment in a mood of defiance mixed with anxiety that others involved in the attacks are still at large. Investigators raided the Brussels neighborhood of Schaerbeek after the attacks and found a computer in a trash can on the street, including a note from Ibrahim El Bakraoui saying he felt increasingly unsafe and feared landing in prison. During a raid of the apartment where the brothers had stayed, investigators also found 15 kilograms of TATP explosives, nails and other material for making explosives, the prosecutor said. 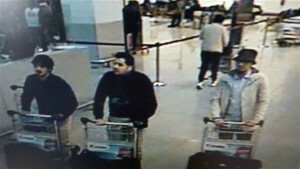 Van Leeuw said authorities do not know the identities of two other people pictured with Ibrahim El Bakraoui in a surveillance photo from the airport that police are circulating. Two were suicide bombers, the prosecutor said; the other was a man in a white jacket and black cap who fled before the bombs went off, leaving behind a bag full of explosives, authorities said. That bag later blew up, but no one was injured. Belgian state broadcaster RTBF, citing sources it did not identify, said Khalid El Bakraoui had rented an apartment that was raided last week in an operation that led authorities to top Paris attacks suspect Salah Abdeslam. A Belgian official working on the investigation told the AP that it is a “plausible hypothesis” that Abdeslam was part of the cell linked to the Brussels attack. The official spoke on condition of anonymity because he was not authorized to publicly discuss an ongoing investigation. Authorities are also still looking for a suspected accomplice of Abdeslam, Najim Laachraoui, whom they have been searching for since last week. It’s not clear if he has any connection to the Brussels attack. Belgian newspaper DH initially reported he might be the man in the white jacket at the Brussels airport but later removed that report from its website. Laachraoui is believed to have made the suicide vests used in the Paris attacks, a French police official told The Associated Press, adding that Laachraoui’s DNA was found on all of the vests as well as in a Brussels apartment where they were made. The official spoke on condition of anonymity because he was not authorized to discuss an ongoing investigation. French and Belgian authorities have said in recent days that the network behind the Paris attacks was much larger than initially thought, and developments this week suggest the same group could have staged both the Paris and Brussels attacks. “It’s a war that terrorism has declared not only on France and on Europe, but on the world,” French Prime Minister Manuel Valls said Wednesday on Europe-1 radio. Valls, who planned to visit Brussels later Wednesday, urged tougher controls of the EU’s external borders. “We must be able to face the extension of radical Islamism … that spreads in some of our neighborhoods and perverts our youth,” he said. The Paris attackers were mainly French and Belgian citizens of North African descent, some from neighborhoods that struggle with discrimination, unemployment and alienation. In its claim of responsibility, the Islamic State group said its members detonated suicide vests both at the airport and in the subway, where many passengers fled to safety down dark tunnels filled with hazy smoke from the explosion. IS warned of further attacks, issuing a statement promising “dark days” for countries taking part in the U.S.-led anti-IS coalition in Syria and Iraq. French Prime Minister Manuel Valls said Wednesday that big events, be they sports or cultural, must not be put on hold for fear of attacks. He said that includes the Euro2016 soccer tournament, a monthlong event being held in France that starts in June. Meanwhile, the Belgian football federation announced that it was calling off an international soccer friendly match against Portugal next week because of the attacks. Contributing to this report were Associated Press writers John-Thor Dahlburg, Raphael Satter and Angela Charlton in Brussels and Lori Hinnant and Elaine Ganley in Paris.